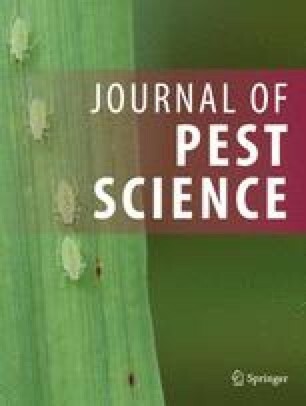 A series of investigations have been carried out on the effect of the entomopathogenic fungusBeauveria bassiana on the various developmental stages ofPhthorimaea operculella. Both first and second insatar larvae were more susceptible than the third or fourth instars. The infected prepupae and pupae resulted in marked decrease in the emergence, longevity of moths, deposited eggs and their egg hatchability. An obvious increase in the pupal duration was observed and the resulting malformed adults were also recorded. The latent effects were markedly obvious, specially in high doses ofBeauveria bassiana.